Football season is in full swing, and this popular American sport is entertaining for more than just the adults. While moms and dads are watching the Sunday NFL game, kids can get in on the action by heading outside and playing these fun football activities. Three Flies Up is a simple, low-competition game that can be played with three or more people (the more the merrier). 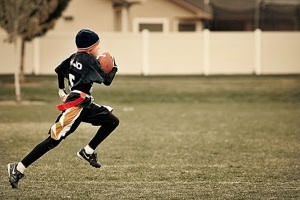 It’s a great activity if children are too young to play a full flag football game or have limited players and space. One person, the “flier,” stands apart from the rest of the group, the “catchers,” and throws the football high in the air. Each individual catcher attempts to run and catch the “flies” while they are still in the air. Once a single person catches three flies, he or she becomes the new flier and the game starts over. If the ball hits the ground before a player catches it, or if a catcher fumbles it, no points are awarded. This is a variation of Three Flies Up that makes it more of a challenge for older kids (and exercises math skills as well as the body!). When the flier passes the ball to the catchers, he or she yells out a random number anywhere between 1 and 500. The catcher who receives the ball earns that number of points, and whoever reaches a score of 500 first becomes the winner and next flier. Three Flies Up and 500 are fun football activities that can be played for as many rounds as the players want, providing hours of entertainment. If there are enough kids to put together two equal teams (of four or more players on each), play a simplified flag football game in the backyard. Use dish towels, rags or bandanas as your flags, and teach kids a few easy plays to get them started. Make sure everyone knows the basic rules so it’s fair and safe, then let them go wild! NFL Play 60 is a campaign designed to get kids active and fight childhood obesity by encouraging them to play for 60 minutes a day. This football season, Play 60 is hosting a contest where kids can enter to win tickets to Super Bowl XLV (with parental permission) by pledging to play 60 minutes a day and answering a couple of questions. Enjoy fun football activities for an hour a day, and be eligible to win Super Bowl tickets! Need a playbook for the season? The Frecklebox personalized football notebook is perfect for the job. CLICK HERE to see our football stuff.